From the moment you check in, you’ll feel the atmosphere that sets Bay View apart from other bed and breakfasts: first-class service, beautiful surroundings, and quiet comfort. Historically, Bay View is open to our guests from the first Thursday in May until (and including) the last weekend of October. 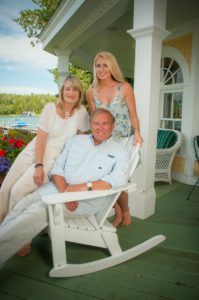 Bay View Bed & Breakfast creates the perfect setting for all your Mackinac Island memories; strolling the boardwalk, savoring our famous Mackinac Island fudge, shopping downtown, bicycling, golfing, swimming, horse-back riding, taking a carriage tour all over the island, or simply gazing at the Straits of Mackinac. Innkeepers Doug and Lydia Yoder, along with their staff, welcome you to Bay View. From the moment you check in, you’ll feel the atmosphere that sets Bay View apart from other bed and breakfasts: first-class service, beautiful surroundings, and quiet comfort. Our front desk staff is ready to guide you through your stay at Bay View and on the island. We’ll help make your getaway complete. Rose and her staff greet you in the morning with a hot, seated breakfast, freshly baked cookies every afternoon, and end the day with a fabulous evening dessert…all with our compliments…maybe even a song! If your vacation schedule permits spending some relaxing time in Mackinaw City, we hope you will consider staying at our beautiful sister inn, Brigadoon Bed & Breakfast in conjunction with your trip to Bay View on Mackinac Island. If this should work with your itinerary, we would like to extend a 10% discount off your first night at Brigadoon. Please visit Brigadoon Bed & Breakfast for details or call (231) 436-8882 for more information.